Dynamic speed signs and displays alert drivers that they are speeding and create a sense of being monitored. Radar-actuated dynamic message display (Hallmark et al./Institute for Transportation). Dynamic speed signs and displays are usually radar-activated signs that display approaching speeds dynamically for individual vehicles and/or display messages, such as YOUR SPEED, SLOW DOWN, or REDUCE SPEED, particularly when an approaching vehicle exceeds a certain speed. These devices can be portable or permanent. They alert drivers that they are speeding and create a sense of being monitored. Devices are placed in a location where a reduction in speed is desired. They may also be used in transition zones to slow traffic in advance of lower speed areas or curves. 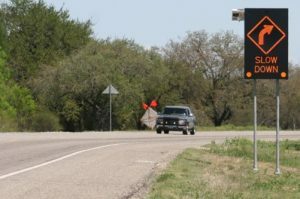 Two different dynamic speed feedback signs were evaluated as part of a traffic-calming research project by Hallmark (2007). One sign technology that displayed current driver speed was effective at reducing driver speeds significantly. Another sign that was capable of providing different messages to drivers, in addition to their current speed, reduced average speeds by 5 miles per hour (mph) and 85th percentile speeds by 7 mph. Dynamic speed signs cost from $2,000 to $12,000 per display. City of Winston-Salem. “Traffic Calming Policy. Section IV.” Traffic Calming Measures, City of Winston-Salem, North Carolina, 2003. Hallmark, Shauna, Eric Peterson, Eric Fitzsimmons, Neal Hawkins, Jon Resler, and Tom Welch. Evaluation of Gateway and Low-Cost Traffic-Calming Treatments for Major Routes in Small Rural Communities. Center for Transportation Research and Education, Ames, Iowa, 2007.